Canciones is a three part summer music series featuring the music of Texas with a South Texas and San Antonio perspective at Pearl Park. 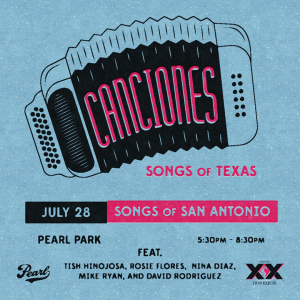 The second part of this series will feature Canciones de San Antonio/Songs of San Antonio Singer songwriter showcase of the iconic songs of San Antonio. Set up in a guitar pull style with 5 individual artists taking turns singing and telling stories about the songs that have helped shape the musical landscape of San Antonio. Both original songs by singer/songwriters as well as classic San Antonio songs covered by performers Tish Hinojosa, Rosie Flores, Nina Diaz, Mike Ryan, and David Rodriguez.